Were they worth the wait? Spoiler Alert: They’ll be spending more time at the back of the drawer. In its most basic form, a “potato nail” is an actual steel nail stuck lengthwise into a potato to help it bake faster and more evenly. The theory is that the nail facilitates this by conducting heat directly into the center of the potato. 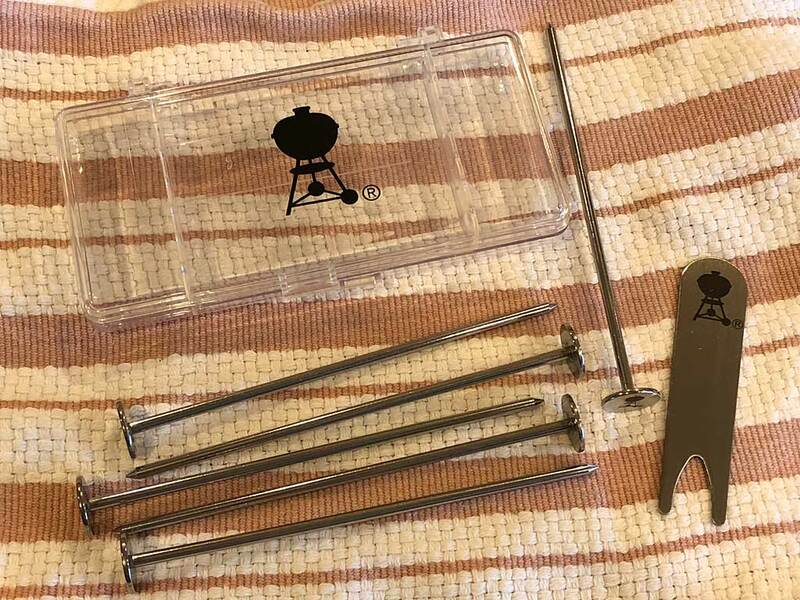 Of course, Weber’s version of potato nails are not actual nails but a set of six stainless steel rods with a sharp point at one end and a flat head at the other. 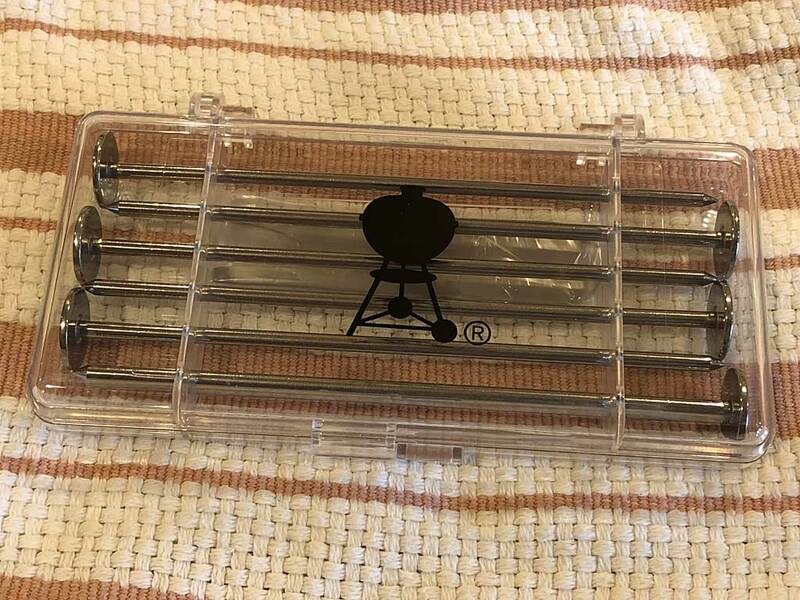 They come in a small plastic storage box and include a stainless steel “nail puller”. 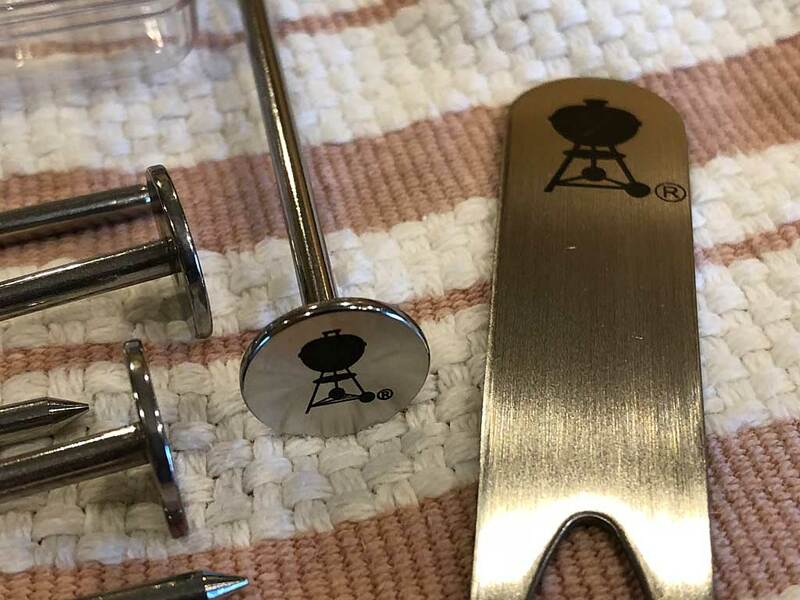 Each piece features the Weber kettle logo in black. In July 2014, Cook’s Illustrated magazine tested the effectiveness of potato nails. 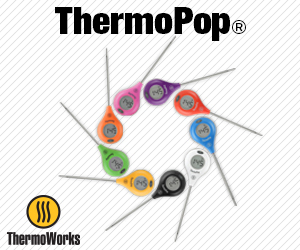 They started with three potatoes of equal weight and baked them at 350°F—one without a nail as the “control potato”, one with an aluminum potato nail, and one with a stainless steel skewer (as a substitute for a stainless steel potato nail). Cook’s found that the potato with the aluminum nail finished first, the stainless steel skewer second, and the control potato third…but there was only a 7 minute difference between the aluminum potato nail and no potato nail at all. We do learn from Cook’s experiment that there’s a difference between materials, that aluminum works better than stainless steel because aluminum is a better conductor of heat than stainless steel. So going into my own little non-scientific test, I’m thinking that the stainless steel Weber potato nails aren’t going to do much. Unlike Cook’s, I did not have the luxury of equal weight potatoes, or even three potatoes for that matter. I had only two potatoes, one weighing 12.25 ounces, the other 13.5 ounces. For my test, I decided to stick the potato nail into the larger potato to see if it would cook as fast as the smaller one. 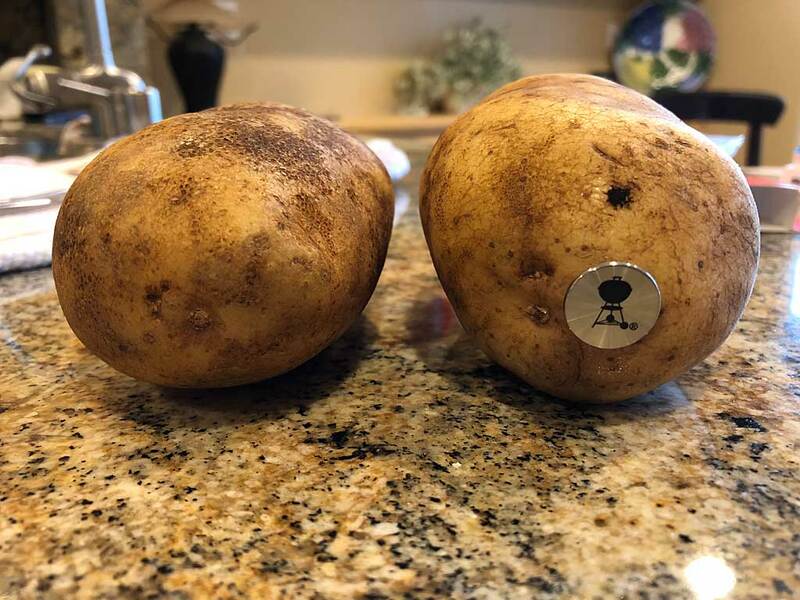 After all, there was only a 1.5 ounce (or 10%) difference between the two spuds. Maybe the potato nail would even out the cooking time between the two potatoes. 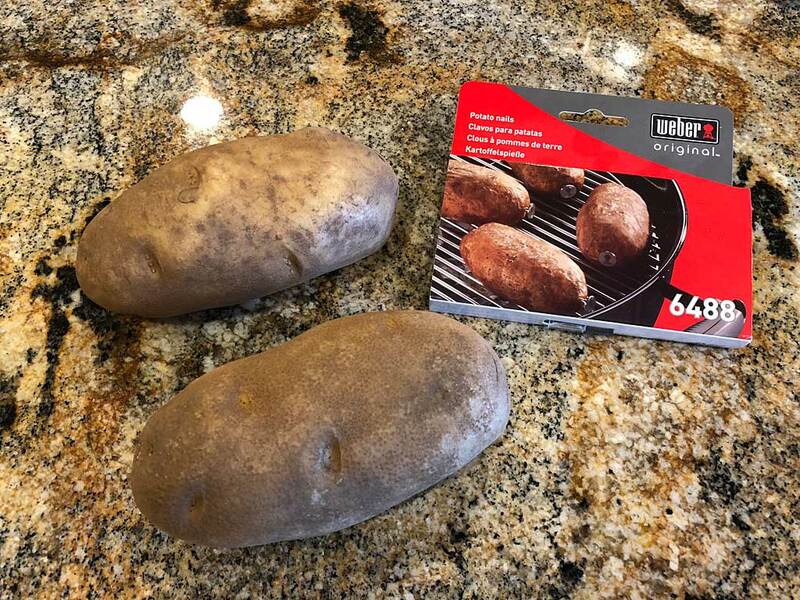 I baked both potatoes at 400°F for 60 minutes, rotating them after 30 minutes, then checked the internal temp of each using a ThermoWorks Thermapen Mk4 instant-read thermometer. 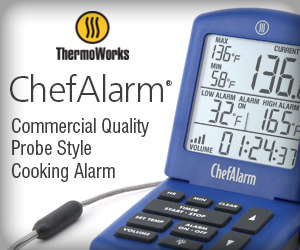 As I wrote in this 2015 post, a perfectly fluffy baked potato will measure 205-212°F internal temp when done. The stainless steel Weber potato nail did not help the larger potato cook as fast as the smaller potato. 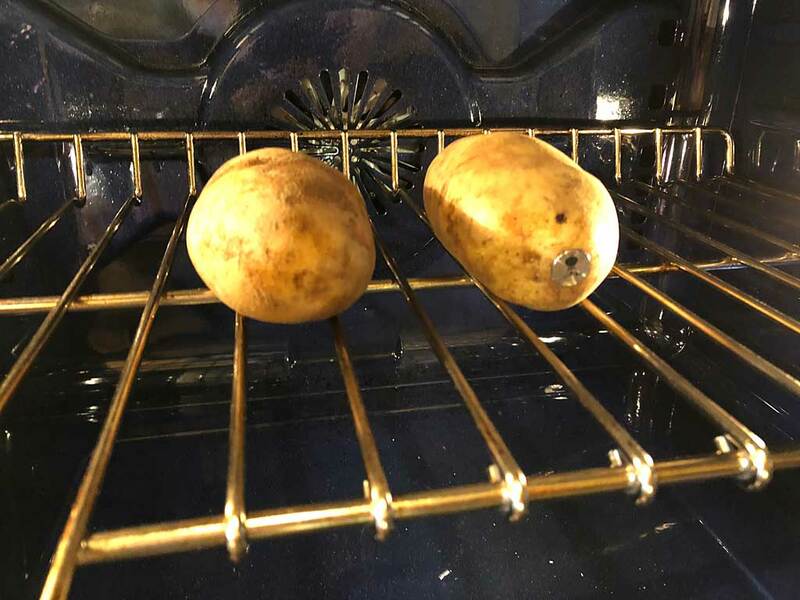 After 60 minutes, the smaller potato (without the nail) was within the 205-212°F range while the larger potato (with the nail) was just short of the range. It took five more minutes for the larger potato to get done. Do potato nails work? According to Cook’s Illustrated magazine, the answer is yes, depending on the material, but they don’t make a significant difference in cooking time. If you insist on buying potato nails, buy ones made of aluminum. Unfortunately, Weber 6488 Original Potato Nails are not made of aluminum, they’re made of stainless steel. They look pretty, they’re well made, and they’re nicely packaged, but they don’t conduct heat as well as aluminum. Based on my experience, I’d say you’re better off saving the $9.99 and spending that money on…a big bag of potatoes! There’s no need for potato nails in your collection of kitchen tools, whether from Weber or someone else.